Time is relative. I certainly can’t demonstrate it by using the intricacies of physics but a stick of yellow candy floss eaten at the St Giles’ fair in Oxford passed as my Eureka moment. 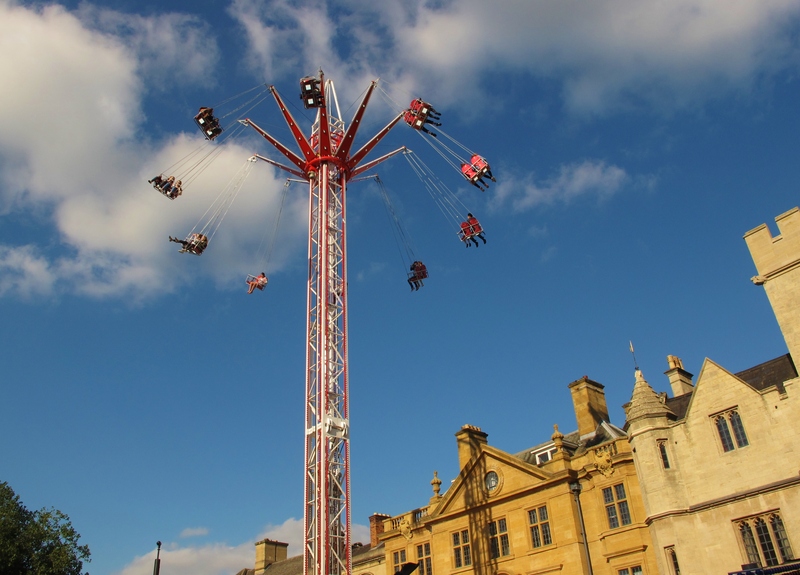 I have lived in and around Oxford for longer than I care to admit and I have never missed going to this fair, held in St Giles usually on the first week-end of September from Sunday to Tuesday. In this way, the event marks the passing of time and the passing of people in my life. Who used to go to the fair with me, who didn’t, who will be. Each time it happens just before going back to school and each new ride I see is like a new class I take or a new responsibility at work. That’s when time seems to be passing by as fast as the drop tower ride and as scarily as the haunted house. However, there is something perennial in the essence of fairs. Each September in St Giles, I am no longer the dependable adult, the woman in love, the woman scorned, the respectable teacher, the good friend. I am forever the 8 year old girl in awe of the heart stopping rides, the flashing lights, the loud thumping of the bass, the palpable happiness and the smell or candy floss and grilled meat floating side by side. The English and the French are completely different people I found during my time in England. It is true when they greet (four silent kisses or 2min outpourings of delight), when they eat (garlic anyone? ), when they love (je t’aime et je te le dis), hell even when they write emails (with very best wishes)! Give us all a fair though, and these differences no longer hold. The faint hearted folks watching the crazy ones being turned upside down or pinned by gravity to a rotor ride give the same look of disbelief and wonder everywhere. Those getting off rides are all high on exhilaration and the kids want to go to the Ghost Train because they are not scared one bit … as long as mummy comes too. When I go to St Giles’ fair, it doesn’t matter what age I am or what county I come from, its language and images are international. Maybe fairs don’t only demonstrate the relativity of time, but that of place too! Ah remember it well, always easy to remember the date, the first Monday after the first Sunday in September. I used to run the Eagle & Child in the 80’s. The dates never change. Funnily enough friends and I met in the Eagle and Child for a pre-fair drink! It doesn’t look like it’s changed much for a long time. It’s got character. Great fair – amazing how close to the old building the rides are…. Les photos sont de plus en plus belles!